Underground mining diamond drilling is a process of extracting core samples from the earth. It is an exploratory process that determines the structural strength of mineral composition for potential mining or construction projects. A diamond implemented drill bit is used in diamond drilling. Diamond coring bits are widely used in the exploration phase of the mining industry. Rock samples are analyzed by geologists to understand the sub-surface geology. Diamond core drill bits are reliable, as they are made from industrial strength diamonds. These drill bits are unlikely to break or get damaged. Increase in demand for base metals such as copper, nickel, lead, and zinc; and precious metals such as gold, silver, and diamond is projected to boost investments in the metal mining business. This is likely to augment the demand for diamond core drill bits that are utilized in underground mining of hard rocks. The order intake of drill bit machines for underground mining, especially for exploration of metals and precious metals, is high than that of coal mining. Diamond core drilling is an ideal method to remove a large piece of cylindrical material. Diamond core drill bits are primarily employed in the exploration industry, especially for hard rocks, as the penetration of diamond bits is high vis-à-vis that of other materials. In November 2018, Halliburton Company released Cerebro in-bit sensor package, a new technology that obtains performance data directly from the drill bit and analyzes it to optimize cutter engagement, reduce uncertainty, and increase drilling efficiency. The new service improves data measurement and overall drilling performance. This is estimated to drive the demand for diamond core drilling bits in underground mining applications. Coal is considered the most polluting fossil fuel. When burned, it causes global warming and acid rain, and contaminates groundwater. Adoption of the clean coal technology has led to more efficient combustion of coal. Under this technology, carbon is captured and stored in order to lower the emission of various toxic gases. Emerging economies in Asia Pacific are the major consumers of coal. These countries also invest significantly in production and development of coal fired power plants. Clean coal technologies are expected to provide efficient solutions for greenhouse gas emission during the burning of coal. This is estimated to boost the overall mining investment in underground coal mines, thereby propelling the demand for diamond core drill bits/drill rigs. In June 2016, Sandvik AB signed an underground mining equipment deal with China-based Lingong Group Jinan Heavy Machinery for the production and sale of surface and underground mining equipment. In 2017, Atlas Copco acquired Mobilaris MCE AB, a Sweden-based company that provides advanced software solutions. This acquisition is projected to boost the former’s underground mining operations and process optimization business. In August 2018, Atlas Copco announced that it is targeting zero-emission underground mining. The company is developing a battery-driven machinery, which is likely to minimize the consumption of diesel and other fossil fuels. In November 2018, Epiroc AB acquired Sautec A.S., a distributor of mining and construction equipment. Based in Tallinn, Estonia, Sautec A.S. has presence in Latvia and Lithuania. In October 2018, Epiroc AB invested in autonomous mining solutions business. The company acquired 30% share of ASI Mining, LLC, which is based in Mendon, the U.S., and is a subsidiary of Autonomous Solutions Inc. that provides technology solutions for autonomous operation of mining vehicles. Latin America is the key region of the global underground mining diamond drilling market. It is expected to maintain its dominance during the forecast period owing to the year-on-year increase in mining activities. Rise in investments in the extraction of underground minerals is expected to augment the demand for hard rock mining in Latin America. Countries in Latin America are beginning to shift to underground mining from open-pit mining. In underground mining, the ore is extracted and the waste rock is left behind. This limits the environmental impact by avoiding the removal of waste rock that has no economic value. In Brazil, the most productive underground mines extract up to 1,000 kilo tons of ore per year. The Government of Chile has started investing increasingly in underground mining. The country accounts for the largest underground copper deposits in the word. These deposits belong to the state-owned National Copper Corporation of Chile. The global underground mining diamond drilling market is highly fragmented; large numbers of local and international players provide underground mining diamond drilling services. Leading players dominate the market. Key players operating in the underground mining diamond drilling market are Sandvik AB., Atlas Copco, Boart Longyear, FORDIA, Geomachine Oy, Wuxi Geological Drilling Equipment Co.,Ltd, VersaDrill Canada, Zinex Mining Corp, SINOCOREDRILL GROUP, and Epiroc AB. Underground mining diamond drilling is a process of extracting core samples from the earth. It is an exploratory process that determines the structural strength of mineral composition for potential mining or construction projects. A diamond implemented drill bit is employed in diamond drilling. Diamond coring bits are widely used in the exploration phase of the mining industry. Rock samples are analyzed by geologists to understand the sub-surface geology. Diamond core drill bits are reliable, as they are made from industrial strength diamonds. These drill bits are unlikely to break or get damaged. This report analyzes and forecasts the underground mining diamond drilling market at the global and regional level. The market has been forecast based on revenue (US$ Mn) from 2017 to 2026, considering 2017 as the base year. The study includes drivers and restraints of the global underground mining diamond drilling market. It also covers impact of these drivers and restraints on demand for underground mining diamond drilling during the forecast period. The report also highlights opportunities in the underground mining diamond drilling market at the global and regional level. The report includes detailed value chain analysis, which provides a comprehensive view of the global underground mining diamond drilling market. Porter’s Five Forces model for the underground mining diamond drilling market has also been included to help understand the competitive landscape. The study encompasses market attractiveness analysis, wherein type and application are benchmarked based on their market size, growth rate, and general attractiveness. 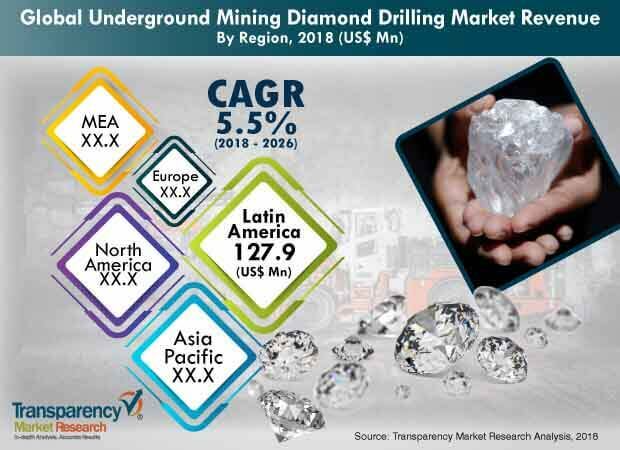 The study provides a decisive view of the global underground mining diamond drilling market by segmenting it in terms of type, application, and region. In terms of type, the underground mining diamond drilling market has been bifurcated into rotary drilling and wireline drilling. Based on application, underground mining diamond drilling market has been divided into hard rock and soft rock. These segments have been analyzed based on present and future trends. Regional segmentation includes current and forecast demand for underground mining diamond drilling in North America, Europe, Asia Pacific, Latin America, and Middle East & Africa. The report provides the actual size (in terms of value) of the underground mining diamond drilling market for the base year 2017 and the forecast for the period between 2018 and 2026. The global underground mining diamond drilling market has been analyzed in terms of revenue. Market numbers have been estimated based on type and application of the underground mining diamond drilling market. Market revenue has been provided in terms of global, regional, and country level markets. The report comprises profiles of major companies operating in the global underground mining diamond drilling market. Key players operating in the underground mining diamond drilling market include Sandvik AB., Atlas Copco, Boart Longyear, FORDIA, Geomachine Oy, Wuxi Geological Drilling Equipment Co.,Ltd, VersaDrill Canada, Zinex Mining Corp, SINOCOREDRILL GROUP, and Epiroc AB. Market players have been profiled in terms of attributes such as company overview, financial overview, business strategies, and recent developments. Latin America is the leading consumer of underground mining diamond drilling services across the globe. The region constitutes more than 30% share of the global market. This trend is expected to continue during the forecast period. Prices of wireline drilling are relatively higher than that of rotary drilling. Sample derived from wireline drilling is more accurate compared to that of rotary drilling. Investments in underground mining have been rising since the last few years. This is likely to benefit equipment manufacturers engaged in underground mining.